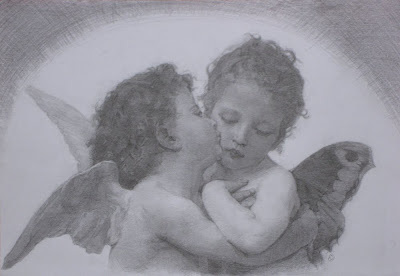 The first is a copy from part of a Bouguereau painting (L'Amour et Psyche, enfants). Angels and whatnot not normally my thing I suppose, but I did this as a present for someone. The second is a Bargue, which I did a year or so ago, and found a picture of it lying around on my computer so I thought I'd stick it on here. Picture quality is pretty bad, but I gave the drawing away, so it's all I've got. 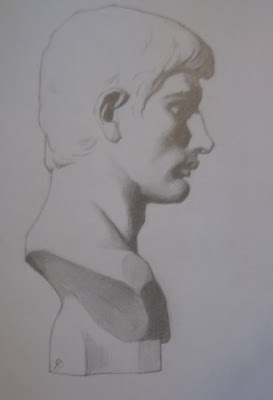 If you don't know Charles Bargue, he was a 19th Century French artist, who created a drawing course for students of classical realism, which was based off a bunch of lithographs that he made, and old master copies. Most modern day ateliers still have their students copy some of his drawings as a way of learning how to handle line, form, sight-size, all that sort of stuff.